Choosing a new dentist is always a personal decision. To help you in making that decision I invite you to come in for a get acquainted visit. Many adults have always wanted their teeth straightened, but did not want silver wires and brackets on their teeth for several years. Today you can finally have your cake and eat it too with systems like, Invisalign, Clear Correct and Six Month Smiles. As a certified dentist for both of these systems I have helped many people get the smile they have always wanted without ever having any metal wires and brackets. Treatment consists of using a series of custom-made clear trays/aligners created from an impression of your teeth with instructions from me on how we want to move your teeth. These trays which you wear over your teeth are smooth and almost impossible to see. Every two weeks you will start wearing a new set of trays. Each set of trays slowly shifts your teeth toward the desired results. While eating you remove the trays. When you are through eating and have brushed your teeth they are put back in. Clear - Most people will never know you are wearing them. Removable - You take them out to eat and brush. This makes cleaning your teeth a lot easier. They also reduce the chance of injury in contact sports where your lip may be hit. 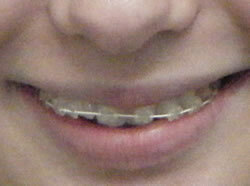 Affordable - Most insurance companies will pay the same as they will for traditional braces. So is a clear tray technique right for you? Probably, but if not we have other alternatives. Check out Six Month Smiles below. It’s hard to believe that you can have straight teeth in just a half of year isn’t it? But that is the average time it takes to straighten your teeth with this system. And since it doesn’t take as long it’s usually cheaper. Many adults want straight teeth but do not want a process that will take one to three years to finish. Also there are some tooth movements that just cannot be done with clear trays. So they put up with their crooked teeth. There is little debate by those doing orthodontics that braces are the most effective way to straight teeth and provide a beautiful healthy smile. Six Month Smiles takes these traditional methods with some modification and adds a more cosmetic approach. So you may be thinking, how does it work. Will I have to wear metal brackets and wires in my mouth? When I straighten teeth this way I use minimal forces to move the teeth that show when you smile. 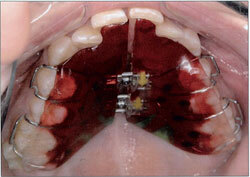 This enables patients to obtain the results they want much faster than other forms of orthodontics. To help overcome the unsightliness of metal brackets and wires I use clear brackets and white wires letting you straighten your teeth without being so conspicuous. During the treatment you will visit the office about once a month. 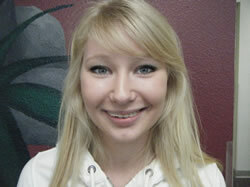 If your child has crooked teeth, consider straightening their teeth and improving their smile with orthodontics. Children’s teeth and jaws continue to grow throughout their adolescence. If their teeth crowd together or align unevenly, a functional appliance can often correct the problem. These removable appliances support an area of the mouth as your child grows, so their teeth will develop with a proper alignment. In many cases, a functional appliance can eliminate the need for traditional braces. An example of a functional appliance can be seen below. For those children still needing traditional orthodontics, this is usually done after they have lost all their primary/baby teeth at about age 12-13. So please feel free to call us for a no cost consultation at 503 665 9737. At that time we can discuss which system is best for you. Answer questions like will it hurt, how long will your particular case take. Also at this appointment, I will complete a comprehensive examination. Since each mouth is unique, I will create a custom treatment just for you and explain the details so you can understand my recommendations.